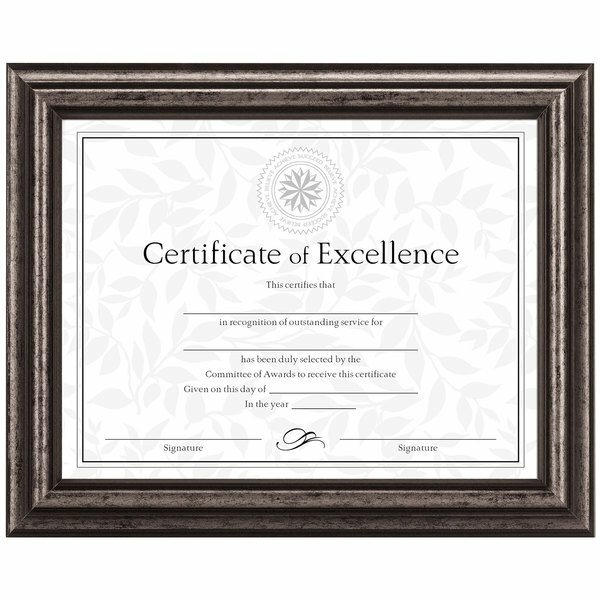 Display your photos, awards, and certificates with this DAX N15790NT 8 1/2" x 11" antique charcoal brushed certificate / document frame. With an antique charcoal brushed finish, this versatile frame is sure to complement any featured document, print, or photo. Made from solid hardwood that is 30% post-consumer and 50% pre-consumer recycled content, this quality frame offers durability for long-lasting use in your office and is easy to seamlessly incorporate into virtually any decor. This frame can hang vertically or horizontally from your wall, or also features an easel back for tabletop display, so you can arrange your office space just the way you want it. Sleek and professional, this frame is an ideal choice for executive board rooms, doctor's offices, and conference rooms. For added convenience, this frame also includes a usable certificate.